Kyle Busch wins the race and his first career championship as Jeff Gordon’s career comes to an end. 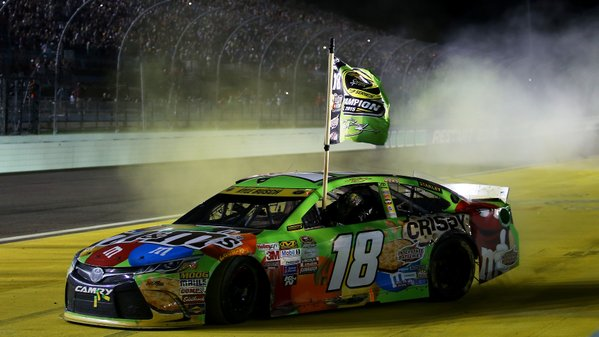 Sunday night at Homestead-Miami Speedway, Kyle Busch not only won the battle – winning the NASCAR Sprint Cup Series (NSCS) Ford EcoBoost 400, but he won the war – winning the 2015 NSCS Championship. This was Busch’s fifth series victory and 16th top-10 finish of the season, his 34th series career victory in 390 races and his first series victory in 11 races at Homestead-Miami Speedway. Following Busch to the drop of the checkered flag were last year’s champion, Kevin Harvick finishing second, Brad Keselowski (led the most laps – 86 out of 267) third, Joey Logano fourth and Kyle Larson finished fifth. Racing in his final full-time NSCS race, Jeff Gordon, claimed sixth-place, while Matt Kenseth finished seventh, Kurt Busch eighth, Jimmie Johnson ninth and Denny Hamlin brought home 10th. 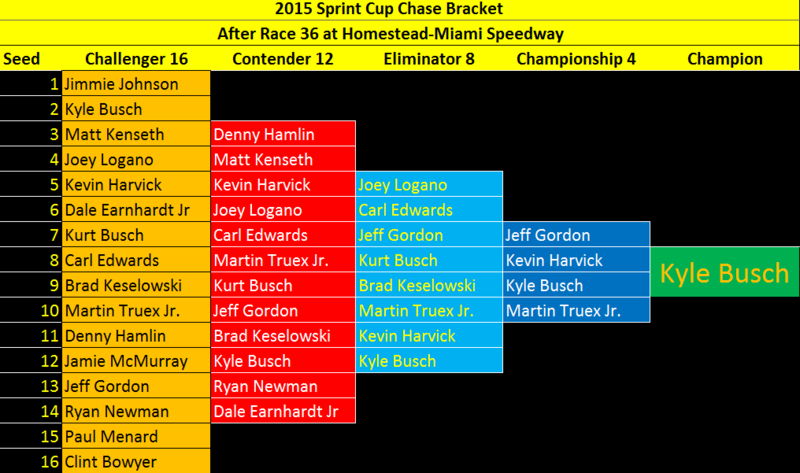 With his victory, Busch won the championship with a 1-point lead over Kevin Harvick. Joe Gibbs Racing won the Owners Championship. Brett Moffitt won Rookie of the Year award. Chevrolet won the Manufacturer Championship. Time of Race: 3 Hrs, 02 Mins, 23 Secs. 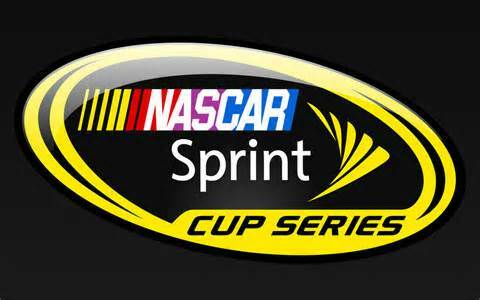 Up Next: The 2016 NASCAR Sprint Cup Series season, with the Sprint Unlimited on Saturday, February 14th, with an approximate starting time of 8:20 p.m. (ET). 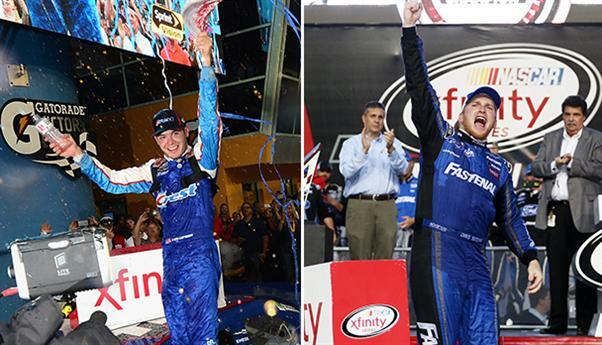 Early Saturday evening, Kyle Larson won the final NASCAR XFINITY Series (NXS) race of the 2015 season – the Ford EcoBoost 300, but for the championship, it was Chris Buescher being crowned the series champion at Homestead-Miami Speedway. Larson, who led the most laps – 118 out of 200, received his first series win and ninth top-10 finish of the season, his third series career win in 75 races, his third series win in three races at Homestead-Miami Speedway. Austin Dillon finished 0.934 seconds behind Larson to finish second, while Erik Jones finished third, Brian Scott fourth and Ryan Blaney claimed fifth. Series Rookie of the Year (ROTY) contender, Daniel Suarez finished in sixth-place, as Ty Dillon took seventh, last year’s champion Chase Elliott eighth, Regan Smith ninth and ROTY contender Darrell Wallace Jr. brought home 10th-place. The 2015 NXS champion, Chris Buescher, finished in 11th-place and won the championship with a 15-point lead ahead of Chase Elliott. The 2015 NXS Owner’s Championship honor went to Roger Penske of Team Penske. For the 2015 NXS Sunoco Rookie of the Year, it was Daniel Suarez taking that honor. Time of Race: 02 Hrs, 20 Mins, 20 Secs. 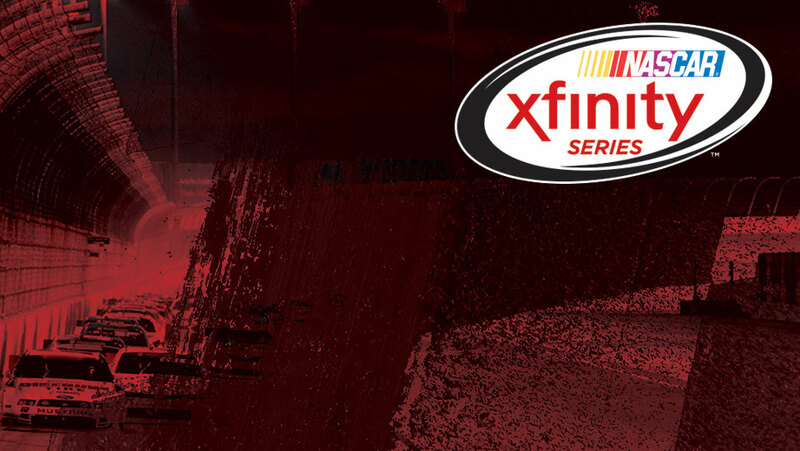 Up Next: The 2016 NASCAR XFINITY Series begins with the Alert Today Florida 300 at Daytona International Speedway on Saturday, February 21st, with an approximate starting time of 3:50 p.m. (ET). 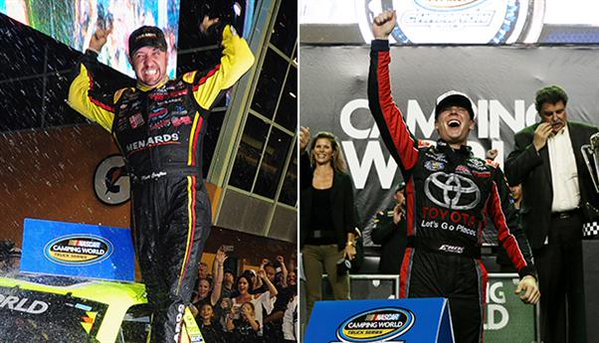 The 2015 NASCAR Camping World Truck Series (NCWTS) season came to a conclusion Friday night, and it was Matt Crafton winning the Ford EcoBoost 200 at Homestead-Miami Speedway,as well as, Erik Jones winning the championship (the youngest in series history). Crafton, who also led the most laps – 93 out of 134, received his sixth series victory and 18th top-10 finish of the season, his 11th series career victory in 361 races and his first series victory in 15 races at Homestead-Miami Speedway. Following Crafton to the drop of the checkered flag were series Rookie of the Year (ROTY) candidate, John H. Nemechek finishing second, Tyler Reddick (finishing second in the points) third, Ben Kennedy fourth and Timothy Peters finished fifth. The newly crowned series champion and ROTY champion, Erik Jones, claimed sixth-place, while Johnny Sauter finished seventh, ROTY candidates Daniel Hemric and Cameron Hayley finishing eight and ninth respectively, and John Wes Townley brought home 10th. With is sixth-place finish, Erik Jones won the championship with a 15-point lead over Tyler Reddick. Time of Race: 01 Hrs, 35 Mins, 10 Secs. 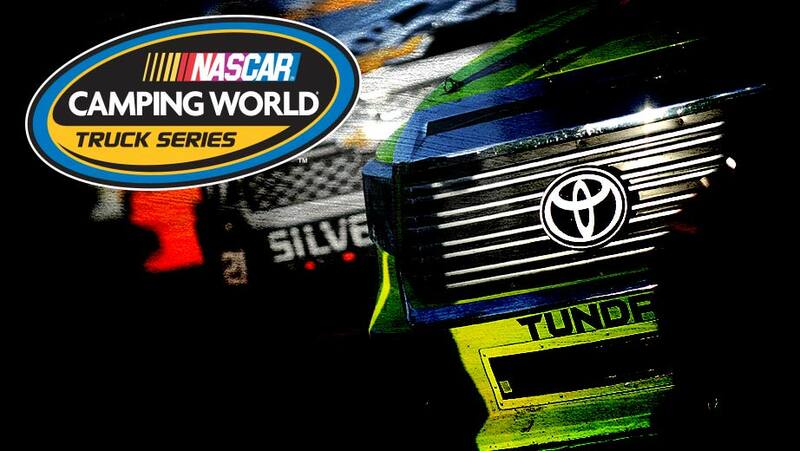 Up Next: The 2016 NASCAR Camping World Truck Series season, with the NextEra Energy Resources 250 on Friday, February 19th, with an approximate starting time of 7:50 p.m. ET on FOX Sports 1.